Will you sell fresh mistletoe this season? How long does mistletoe keep? Do you take debit and credit cards online? Do I need a PayPal or Amazon account for online orders? I am outside the UK – how can I order? Can you deliver to multiple delivery addresses? Do you sell mistletoe medicines? Can I sell you my mistletoe? We are a small, winter season business supplying fresh mistletoe, mistletoe grow-kits, books and cards. Our mistletoe is harvested from farms across the English mistletoe heartlands of Worcestershire, Gloucestershire & Herefordshire. We are entirely online – we do not have a shop that you can visit. 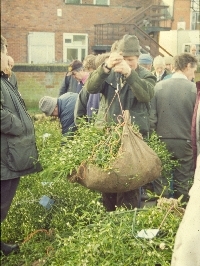 Our aim is to provide a professional service, supplying high quality and freshly harvested mistletoe products, drawing on our experiences with the original Tenbury Wells online mistletoe business which we helped establish and run from 2004 to 2009, and on the expertise of mistletoe expert Jonathan Briggs, who is a key part of our team. All our pricing is inclusive of UK postage. For delivery outside the UK please contact us before ordering. Grow-Your-Own Kits are only despatched in February or March, but can be ordered any time. There is a Grow-Kit Gift Card option if you want to give a Grow-Kit as a Christmas present. Office address – English Mistletoe Shop, c/o 46 Arrowsmith Drive, Stonehouse, Glos, GL10 2QR. (we do not have an actual shop). Phone – you can ring us on 01453 808215 but do note that in season we are often out of the office and you’ll get the answerphone. We will ring you back – so do leave a message! The quickest way to contact us, wherever we are, is whilst online (which you are if you’re reading this!) using the contact form above or by email. Please also note that we do not sell any medicinal mistletoe and that we cannot advise on mistletoe use in medicine. Sorry, we are not selling fresh mistletoe to retail customers this season, but we are selling our popular grow-kits and grow-kit gift cards. Our prices include UK post and packing, usually by Royal Mail First Class. We cannot guarantee delivery on any particular day unless you make a special order – which will involve extra charge – please contact us before ordering if this is what you require. If you require delivery outside the UK you must let us know before ordering – overseas orders placed without enquiring will be cancelled and refunded. When do you despatch and when can I expect delivery? – Books, Cards and Grow-Kit Gift Cards are normally despatched within two working days of your order, and are usually sent by Royal Mail First Class. – Grow-Kits are only despatched from early February to early April. The ordering system asks you to select a despatch period within this period to suit your requirements. Delivery: Most orders are sent by First Class Royal Mail so should be delivered in 2 to 3 working days, but we cannot guarantee any particular day (unless a special order by prior arrangement). Please bear in mind that transit times increase closer to Christmas. 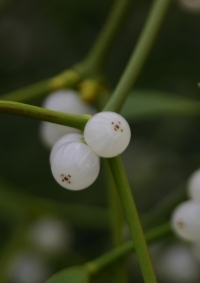 English mistletoe will stay fresh for about two weeks – but only if it is kept cool. Once inside a heated building it will dry visibly after a few days. Unlike most wholesale mistletoe dealers we do not store our mistletoe – instead we pick to order, aiming to ensure you get it as fresh as possible so that its ‘shelf-life’ with you is as long as possible. Delays in delivery (over weekends etc) can reduce its life significantly, as we have no control over how it is stored after it leaves us. You can order online by credit or debit card, which we process via PayPal (whether or not you have a PayPal account) or, if you have an Amazon account via Amazon Pay. Having made your selection just click on the ‘Add-to-Cart’ button next to each item. You can then view the items in your shopping cart before proceeding to checkout (the cart can be accessed via the top or side menus, and any items in it will appear in summary in the left-hand column at all times). There is no obligation until you have completed checkout. The Amazon Pay option will open a different checkout page to the main check-out. You can order any item by post. Just write down want you want to order (making sure you add despatch period information where appropriate) and send that, with your delivery address information and a cheque for the total amount (all our prices include UK shipping) payable to ‘English Mistletoe Shop’. Send all this to our office address: English Mistletoe Shop, c/o 46 Arrowsmith Drive, Stonehouse, Glos, GL10 2QR. If you have any queries about ordering by post please contact us first. Email is easiest and quickest – our address is englishmistletoeshop@mistletoe.org.uk, though you can also phone. The shop phone is 01453 808215 but is often unattended – we will ring you back if you leave a message. We can now take debit or credit card orders by phone. Do note that we are often away from the office so you may just get the answerphone – but we will ring you back if you leave a message. You can checkout with any credit or debit card using PayPal – just follow the main Proceed to Checkout links and choose Proceed to PayPal. You can login to PayPal there if you have a PayPal account. If you don’t have a PayPal account click ‘Checkout as a Guest’ on the PayPal page. Or you can checkout using your Amazon account – and any debit or credit card you use with that. Click on the Amazon Pay logo to log in and then follow instructions from there. After payment you will receive a confirmation email from us detailing your order, plus a separate email from Paypal or Amazon confirming your card payment. No, you do not need to have a PayPal or Amazon account. If you have neither just follow the Proceed to PayPal link after entering your address – you can use any debit or credit your card on PayPal without opening an account (click ‘Checkout as Guest’ on the PayPal page). If you do have a PayPal account you can link to that from the checkout site. If you have an Amazon account you can pay via that by clicking the Amazon Pay link in the Cart or Checkout pages. Many of our products (fresh mistletoe and mistletoe grow-kits) cannot be sent outside Europe. For Grow-Kit Orders within the EU please see the instructions below. For book or postcard orders anywhere overseas please contact us with your requirements. We will calculate the extra shipping costs, check this is acceptable to you and then send a tailored Paypal invoice. There may be customs restrictions in some countries. Overseas orders placed without contacting us will be cancelled and refunded. We can send grow-kits to other parts of the European Union at a cost of £18.50 per grow-kit including shipping. To order for EU delivery you need to email us telling us how many you require, the despatch period (choose from 1st-14th February, 15th -28th February, 1st-14th March, 15th-31st March or Anytime in Feb/March) plus your name and delivery address. You can send us that email by writing to englishmistletoeshop@mistletoe.org.uk or put the information in our enquiry form here. We will then email you an invoice which can be paid with with a Paypal account, or with a credit/debit card via Paypal (you do not need a Paypal account for this). Because of plant import regulations (for many countries) and for ecological reasons we do not send our Mistletoe Grow-Kits outside Europe. Orders to multiple addresses may incur additional costs – contact us with your requirement and we will let you know costs. No, we do not sell any medicinal mistletoe and we cannot advise on mistletoe use in medicine. We do not generally buy mistletoe that has already been cut – we prefer to cut it fresh ourselves from orchards, by agreement with the landowner/tenant. We can offer, in conjunction with the harvest, a mistletoe management service, cutting both the female and male plants and reducing the burden of mistletoe overgrowth that is becoming a problem in so many orchards in our area. Much of this overgrowth is comprised of neglected male plants, left on the tree as they have little commercial value compared to the berried female plants. Please note that we sell English (and sometimes Welsh) mistletoe – we do NOT buy (or sell) any mistletoe from outside the UK and have no interest in buying mistletoe from mainland Europe (or anywhere else in the World!). We are a small, winter season business supplying fresh mistletoe, mistletoe grow-kits, books and cards. Our mistletoe is harvested from farms across the English mistletoe heartlands of Worcestershire, Gloucestershire & Herefordshire. All our prices include UK shipping. For delivery outside the UK please contact us before ordering. Checkout – PayPal or Amazon? You can checkout with any credit or debit card using PayPal - just follow the main Proceed to Checkout links and choose Proceed to PayPal. If you don't have a PayPal account click 'Checkout as a Guest' on the PayPal page. Or you can checkout using your Amazon account - and any debit or credit card you use with that. Don't click on PayPal - click on the Amazon Pay logo instead to log in and then follow instructions from there. Mistletoe Talks, Walks and Workshops: Information on mistletoe activities! The best way to contact us is by using the Contact Form on the FAQs page or by direct email. Email, postal address and answer-phone details are given on the FAQs page. The English Mistletoe Shop © 2019. All Rights Reserved.